• May a player use both left and right-handed clubs during a round? Yes, there is nothing in the Rules that penalises a player from carrying whichever clubs they like, providing the clubs are conforming, and the player does not use more than the permitted 14. • May a player use a right-handed club with a left-handed stroke? Yes, a ball may be struck with any part of the head of the club. So a right-handed player, whose ball lies in a position whereby they cannot make a right-handed stroke at it, may either turn their clubhead 180º to hit their ball with its face, or use the back of the clubhead to strike their ball from a left-handed stance. Rule 14-1. • Is the nearest point of relief always in a different place for a left-handed player than it is for a right-handed player? • May a player putt their ball one-handed into the hole whilst holding the flagstick with the other? Yes, providing they do not use the flagstick for assistance, e.g. by leaning on it, and also that the ball does not touch the flagstick. Decision 17-1/5. • If a player, who cannot play their natural right-handed stroke because of the position of their ball against a tree, decides to play left-handed away from the tree, may they take relief if they then find that their stance for the left-handed stroke means that one of their feet will be in casual water? Yes, the player may take relief without penalty from the casual water in these circumstances and may then play their next stroke either right or left-handed. Rule 25-1b. If you have not yet subscribed to the ‘Rhodes Rules School’ photo series, you can do so here (free weekly emails using photos and diagrams to pose questions, with answers and references, of Rules situations that we may encounter on the golf course). If you are a subscriber and would like to purchase the set you can now do so at this link. in the nearest point of relief video, you state that the point of relief is different for a right handed player than a left handed player. i understand that. in the above explanation a player can choose to play a shot left handed and then get relief from casual water but then play the ball right handed. why can't a player do the same in deciding on the nearest point of relief and say he intends to play the ball left handed? A putt lips out and ends up on the opposite side of the hole from where the putt was taken and now it's just a tap in. Instead crossing over to the other side of the hole and taking a normal putting stance and stroke, the golfer reaches over the hole and taps the putt in towards herself. Is this a violation of rule 14-1? 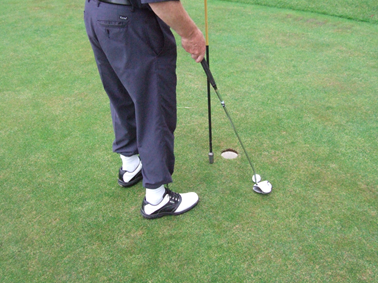 There is no penalty if the stance is inadvertently taken on or astride the line of putt (or an extension of that line behind the ball) or is taken to avoid standing on another player’s line of putt or prospective line of putt. Changing my playing side from left handed to right this year. Have an 18hdc currently. Is there anything in the rules that lets me get it to 54, f ex? Cant find such cases described anywhere online. This is a Handicapping System query and is not relevant to the Rules of Golf, which is my only area of expertise. I recommend that you, or the Committee of your Club, address your query to your National Golfing Body. Playing right handed, may I hold club in right hand and make the stroke without left hand being on the club? Yes, as in the photo in the above blog!!! Was so busy reading I missed the photo. So I could do this with any club in the bag then? This means I could chip with one hand if I wanted to? Yes. In fact, there are many one armed golfers playing competitively.